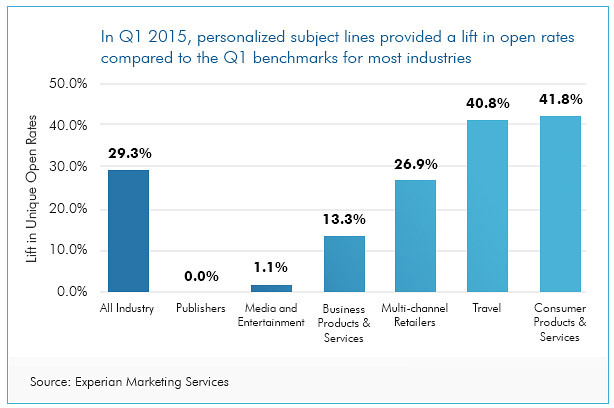 The Power of Personalized Subject Lines in Email Marketing | ASTRALCOM - Content Strategy, Conversion Marketing and Customer Acquisition. If your email marketing efforts aren’t including your customers’ names in the subject line, you’re missing out on a 29.3%lift in your open rate. If that isn’t enough to convince you then how about these post-click metrics from Experian that boasts transaction rates 49% higher and revenue per email 73% higher with personalization. Read more about this in Daniel Burstein’s article on MarketingSherpa. You can also learn more about the elements of a successful email in our infographic and post on How to Create a Successful Email Message. Don’t have the time? We do! Reach out to us by clicking or calling us at 800.536.6637 to help you create more powerful emails for better results! Which Media Channel Has The Best ROI?